Have Russia and Iran ‘Won’ in Syria? As Russia continues to pound Syria’s largest city, Aleppo, sending thousands more desperate people surging toward the Turkish border, it is hard to deny that U.S. diplomatic strategy on Syria is in disarray. 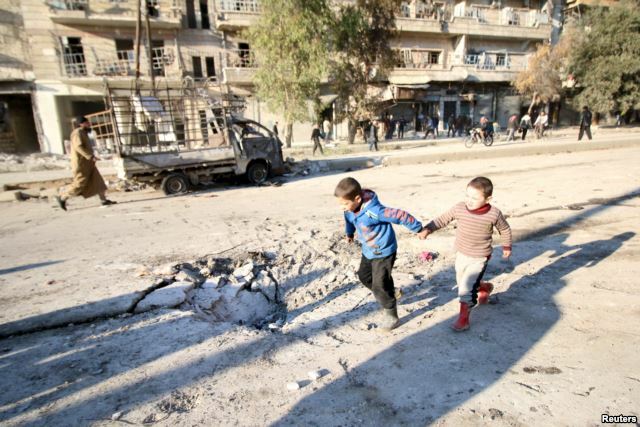 Boys run near a hole in the ground after airstrikes by pro-Syrian government forces in the rebel-held al-Sakhour neighborhood of Aleppo, Syria, Feb. 8, 2016. Kerry, who has prided himself on his close relationship with Russian Foreign Minister Sergei Lavrov, then called on Moscow to “join in the effort to bring about an immediate ceasefire and … full humanitarian access” to more than half a million Syrians under siege, primarily by forces supporting Syrian President Bashar al-Assad. Kerry will make one more effort to shame Russia into stopping the bombardment when he meets with Lavrov again on the sidelines of this week’s Munich Security Conference. Speaking at an event at the Atlantic Council, Hof predicted that the Russia-Iran-Assad coalition would next turn its attention to southwest Syria, triggering another mass civilian exodus toward Jordan, which is already struggling to deal with tens of thousands of Syrian refugees. Russia has proved to be a master of using negotiations as a smokescreen for military action to change facts on the ground in its efforts to reclaim strategic territory for Assad. Syrian opposition factions, meanwhile, refused to join formal peace talks under U.N. auspices in January while the Russians were bombing Aleppo and pro-Assad forces were besieging other opposition hubs. It remains to be seen if the Russians and Iranians will agree to a pause to allow much needed aid to reach residents of Aleppo and those congregated around the Turkish border. According to The Washington Post, the Russians have sent a letter to the Obama administration promising a cease-fire on March 1, plenty of time to consolidate their gains. 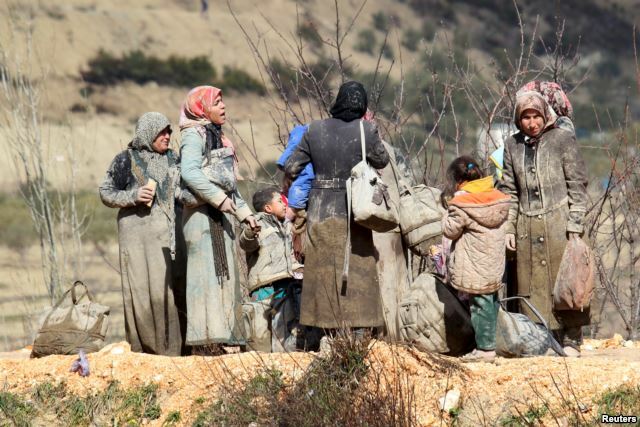 Internally displaced people, covered with mud, wait as they are stuck in the town of Khirbet al-Joz, in Latakia countryside, waiting to get permission to cross into Turkey near the Syrian-Turkish border, Syria, Feb. 7, 2016. Beyond addressing the immediate humanitarian crisis in northwest Syria, the U.S. needs a new strategy for Syria. More than four years after Obama said Assad must to step down, the Syrian dictator is more entrenched than ever. With Russia focused on destroying non-Islamic State (ISIS) opposition groups, Assad and his allies are forcing the world into making a choice between them and IS. Pro-Assad forces are responsible for many more deaths in Syria, but Islamic State is the greater threat internationally because it attracts fighters from dozens of nations and has inspired, if not organized, spectacular terrorist attacks abroad. If Assad were to step down, it is not at all clear who or what would replace him and whether a successor could more effectively marshal forces against ISIS. In Iran, meanwhile, support for Assad has strengthened since IS proclaimed its “caliphate” in the summer of 2014. “For Iran, Syria is an existential issue,” Amir Handjani, an Iranian-American businessman, told the Atlantic Council. Iranians “view the Assad regime as a Shi’ite regime, a moderate regime that is able to confront ISIS ”which regards Shi’ites as apostates,” Handjani said. For nearly 40 years, Syria has been allied with Iran, against Iraq during the 1980-88 Iran-Iraq war and in Lebanon, where Iran and the Assad regime back the militant group, Hezbollah. Since a popular uprising against Assad began in 2011 and turned violent following his brutal crackdown, Iran has encouraged Hezbollah and Sh’ite fighters from other countries to come to Syria to fight alongside Assad’s troops. Further undermining the prospects for peace is the deepening rift between the biggest Shi’ite and Sunni powers, Iran and Saudi Arabia. Rattled by growing Iranian influence in the region and worried about U.S. reluctance to intervene more forcefully against Iran, the Saudi government last week said it would send troops of its own to fight in Syria. Saudi forces have been more preoccupied with fighting Shi’ite Houthi rebels in Yemen, a country on its southern border that is a more immediate security threat to the kingdom than the Assad regime, Iran or Islamic State. 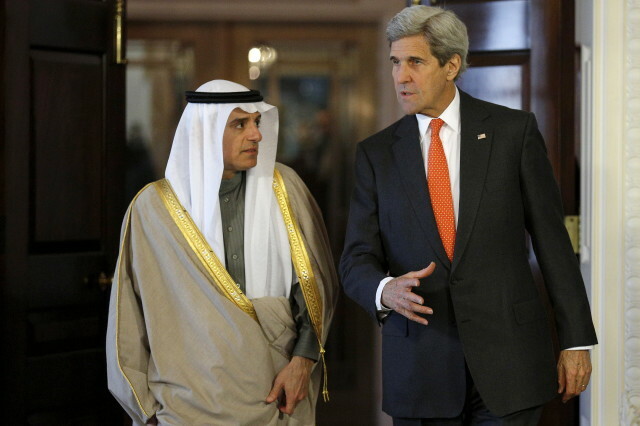 The Saudis “are turning the tables on Kerry,” David Ottaway, a scholar of Saudi Arabia at the Woodrow Wilson International Center for Scholars, told the Atlantic Council audience. They’re saying “we’ll do more but you have to do more” first. The latest humanitarian catastrophe on the Turkish-Syrian border is increasing pressure on the Obama administration to establish some sort of haven in Syria for refugees. However, State Department spokesperson John Kirby said Tuesday that such a zone would not be an “antidote” to the crisis. It appears that the administration is no more willing to intervene than it has been for the past four years. Given the administration’s limited time in office and a bipartisan reluctance to send large numbers of American troops to the Middle East, the most that can be expected is more financial aid to the refugees. A new State Department budget calls for $6.2 billion in such aid, most of it provided through U.N. agencies. Handjani, noting the unintended and usually negative consequences of previous U.S. military interventions in the region, said that it was up to countries in the Middle East to resolve these crises on their own. Ultimately, he said, Iran and Saudi Arabia would have to reach an accommodation to contain the fighting in Syria. But apart from some informal dialogue between academics and antagonistic speeches in multilateral settings, these two great powers are talking past each other to the extent they are talking at all. Meanwhile, Russian leader Vladimir Putin is relishing a victory over an old Cold War rival. Barbara Slavin is Acting Director of the Future of Iran Initiative at the Atlantic Council in Washington.